There will be a chance to win attractive gifts and prizes worth billions of đồng, promotions with hundreds of major brands, and events at Vincom during the Lunar New Year. One could win up to 30,000 gifts and prizes and super promotions up to 50 per cent at Vincom’s 46 commercial centres nationwide on the occasion. To celebrate the Lunar New Year, Vincom shopping centres will be decorated for the Spring Festival, from the greeting gates, the squares, the events areas to every booth in the shopping centres. Using traditional peach blossom and apricot flowers with a unique and creative expression, every space at Vincom will become a destination for people to enjoy the Tết holiday. 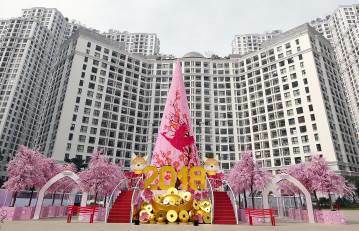 On this Lunar New Year, Hanoians will “glitter” at the Lucky Spring, created on an area of nearly 300-square metres, using 150,000 flowers, at the Vincom Mega Mall Royal City. The artwork will reflect everyone’s wishes of greater luck, happiness and success for a new year. On Friday, February 2, customers can also win an iPhone X and 1,000 other gifts at the mall’s unique dance performances while artists will perform the lantern dance at the impressive 2.5-metre tall Mai Hoa Thung columns, symbolising prosperity, prosperity and overcoming challenges. 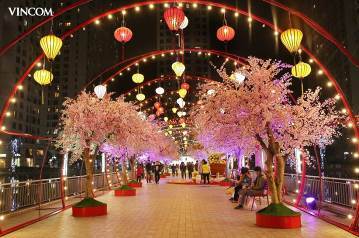 At the Vincom Mega Mall Times City, people can take photos of the Tết holiday and acquire luck at the Lucky Tree and Cherry Blossom Road along the Romantic Music Lake. 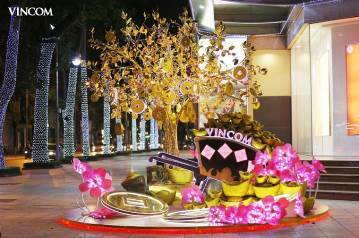 Vincom Centre Bà Triệu and Vincom Centre Đồng Khởi aims to attract visitors with the Lucky Tree and Lucky Car, which were exquisitely made by artisans from giant gold coins. Touching the Lucky Tree is like bringing home luck while the scenery decorated in these two commercial centres aims to attract the attention of customers, to encourage them to visit and shop. The colours of cherry blossoms and apricot and the mascot of the year will also make Vincom’s shopping centres busy places for families to get together and enjoy the warmth of each other’s company while filled with laughter. In the warm spring air, customers visiting Vincom will not only experience the activities in the shopping centres, but they can also purchase useful products during the Lunar New Year, with a major discount of up to 50 per cent. Major fashion brands, such as Zara, Mango, Geox, Bata, Karen Millen, IVY Moda, Canifa, The Blues, G2000, Charles & Keith, Furla, Nine West, Ecco, Aldo, Timberland, Pandora and Swarovski, as well as major furniture companies, such as Lock & Lock, Goldsun, Modern Life and Kyoryo, are launching major promotional campaigns at the end of the year, with many types of products to meet their consumers’ demands. VinMart Supermarkets will also offer their customers the chance to win gold, with a total value of up to VNĐ2 billion (US$87,720), through a campaign, titled, “The More You Buy, The Luckier You Are.” VinMart’s 2018 gift baskets are also popular with customers, with many choices being available, from traditional gift baskets to fruit or vegetable baskets, at prices ranging from VNĐ199,000 to VNĐ2,999,000 each. 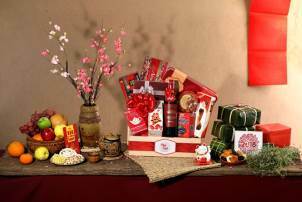 Every gift basket includes genuine products selected from reputable suppliers, and were designed and selected according to the colours of the five elements, bringing luck to their beneficiaries. Meanwhile, the electronics and technology supermarket, VinPro, is offering many electronic products, and the opportunity to win “Super Gifts” of up to VNĐ100 million, creating a festive atmosphere. More than just a place to shop, Vincom is a year-round destination where families, friends and colleagues can enjoy meals and talk about the previous year. Nearly 600 food stalls, from three regional restaurants to Japanese, Korean, Thai, Italian and American restaurant chains, are offering a variety of dining choices for year-end and New Year parties. To celebrate Tết during the February 3 and 4 and February 9 and 11 weekends, all Vincom commercial centres will open their Spring Fair, where customers can select their favourite items at attractive discounts while experiencing exciting activities and interesting games. Customers with official invoices totalling a minimum of VNĐ1 million will also have the opportunity to participate in the “Lucky Spring Picking Gift,” to win one of 30,000 cute gifts, such as a Vincom lucky bag, the lucky New Year mascot of the Year of Dog, flower fortune and additional VinID card points. Vincom shopping centres will be open until 12:00 on February 15 and will open again from 09:30 on February 19 for the festival, to celebrate the New Year and give away lucky money. CGV Cinemas, Lotte Cinema, BHD Cinema, Speed Bowling MQ Thai, Starbucks and Highlands Coffee will also be open during the Tết holiday. 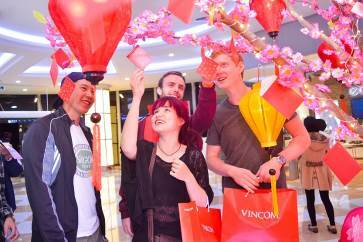 As part of its desire to build shopping and entertainment areas, along with a series of promotions for the start of the Lunar New Year, Vincom continues to be an unforgettable destination during the largest traditional holiday season of the year, where customers can have memorable experiences with their loved ones.